If you missed my posts about the various Ukrainian weddings I attended, and took pictures of the Korovai, here are the links to these posts. 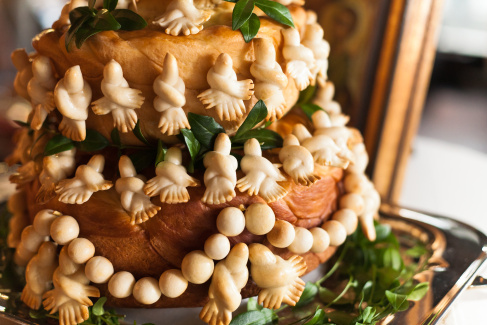 Korovai is a special, creatively decorated bread, with one, two, or three tiers, which is usually made by the Mother of the Bride, and presented to the Bride and Groom, with a special blessing. 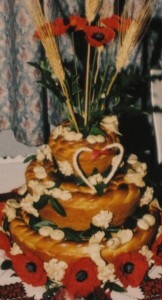 This elaborately decorated bread is displayed at the wedding reception hall, placed near the head table, or by the wedding cake, on a small table adorned with Ukrainian embroidered scarf (rushnyk). There are different styles of Korovai, depending on the region of Ukraine it originated from. A basic Paska recipe, may be used to make the Korovai, or any other special bread recipe will do. The Peremyshl Korovai printable recipe is at the end of this post. One of my readers, Olya M. from Boston, Massachusetts, USA, shared a picture of the Korovai she made for her daughter’s wedding. She did a beautiful job, and you will not believe that this was the first Korovai she ever made by herself. Here is another stunning looking Wedding Korovai, created by a very talented young lady and her mom, for their first time, to use at her own wedding. If you wish to read about it, please visit her blog, Modernyj Korovai. As you can see she is a very talented lady, and her daughter must have been very proud of her mom’s creation. I made my daughter’s Korovai, but used my Paska recipe, and she selected a three tier Korovai, as you can see in the picture above. Today I will post a Korovai recipe from the Peremyshl region of Ukraine, now (Przemysl) under Poland, located very close to the border of Ukraine, and the city of Lviv. This region is very dear and near to my heart, since my family roots are from there. This recipe has been shared with me at a Korovai baking class, which I participated in, a while back. 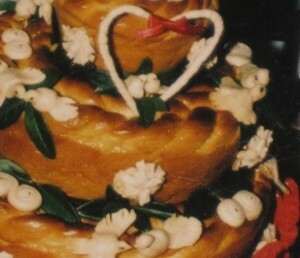 This recipe is for one tier Korovai, and a smaller one, for the Bride and Groom to keep as a memento. Combine milk , water, and 2 Tbs sugar, in a large bowl. Sprinkle yeast over it, and let it rise, until frothy. Add 5 cups sifted flour, and salt. Mix well, and allow to rise until double in bulk. Beat eggs with 1/2 cup sugar, until frothy. Add vanilla, rum, and lemon zest, as desired. Add remaining flour to yeast mixture. Add beaten eggs, and melted butter. Knead until the dough is smooth, and no longer sticks to the hand (15 minutes). See TIP below, for food processor instructions. Knead the dough for several minutes on a lightly floured work surface. Divide into 3 parts (3 lbs for the main Korovai, 1 lbs for the memento Korovai (0r a second tier, if you chose to have two tiers), and the remainder of the dough for decorations. Place the dough in lightly oiled bowls, turn once, cover loosely with plastic wrap, and allow to rise until double in bulk. Grease and flour a 10 inch diameter paska baking pan, for the main Korovai. Repeat the same for a smaller pan (8 inch) for the second Korovai. On a floured work surface, knead the larger portion of dough, removing bubbles. Roll the 12 oz pieces into 3 strands, 28 inches long, and more than 1 inch thick, and form a braid. Arrange in a circle around the bottom of the pan, overlapping ends. Roll the 4 oz pieces into 2 strands, about 29 inches long. Twist tightly (about every inch), and place on top of the braid, on its outermost rim, overlapping ends. Roll the 3 oz piece into a small ball, flatten the top, and place in the center. Cover lightly with plastic wrap, and let rise until double in bulk. Repeat above instructions to make a smaller replica of the Korovai in the smaller pan, if you will use it as a second tier, or in a pie plate if you to be kept as a memento. Brush both breads with egg glaze and bake in preheated 350 degrees oven, with pans not touching, for 15 minutes. Lower the temperature to 325 degrees, and continue baking. Remove the smaller Korovai after about 30 additional minutes of baking (total of 45 minutes). Allow to rest for several minutes, then remove from the pan, and cool on a rack. Bake the larger one 15 minutes more (total 1 hour), or until the bottom sounds hollow when tapped. Allow to rest for few minutes, then remove from pan and cool on a rack. Once totally cooled off, wrap in aluminum foil and refrigerate, or freeze, until ready to assemble and decorate for the wedding. Combine milk, water, salt, and 2 Tbs of sugar. Pulse once. Add yeast and and pulse again. Set aside. Beat the eggs with 1/2 cup of sugar until frothy. Add vanilla, rum, and lemon zest. Melt butter and cool. Combine 5 cups of flour with 1/2 of the yeast mixture, 1/2 the egg mixture, and 1/2 of the melted butter. Process until a ball of dough forms (2 -3 minutes). Allow to rest. Process 1 more minute. Repeat with remaining ingredients. From this point on, follow the remaining instructions in the original recipe. Excellent. It is true that I really missed your posts about the various Ukrainian weddings you attended. I’m so glad to see your pictures of the Korovai through the links you’ve been given to these posts. Great! I am happy to hear that you had a chance to check out the other links, and enjoyed the pictures. I am not familiar with that village name, but then again, I was just a young teenager when I came to US. Although, where I lived, I knew a family with the name of Zhorniak, and I think there were Stechyshyns living around Irvington/Newark, New Jersey. Thank you for stopping by, and for such nice comments. Wow, I am so excited for you. I know your paska will turn out great, since it sounds like your mama did a wonderful job showing you her technique. I have additional tips about paska baking in my post of this week, so please check it out. Hi Pani Vlodia. I am Olia’s daughter – we made one of the korovaj’s which you posted a picture of. I want to thank you for your recipe for decorations! I was using egg whites, milk, oil and flour and it was ok, but never consistent and would take overnight to set up. Yours is easy to make, only needs an hour to rest and makes such a smooth dough! Diakuyu! You are most welcome. I’m glad you tried my recipe and found it easy and helpful. I am so proud of your interest and hard work dedicated to keeping up with the Ukrainian Wedding Tradition of making Korovai. Your Korovais are absolutely gorgeous!! This is such a beautiful tradition, but there are very few people who are able, or willing, to make these special breads. I wish you continued success, and thank you very much for sharing such a sweet comment. 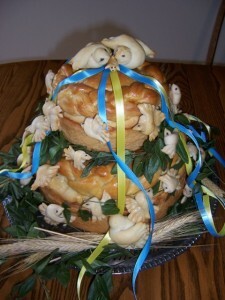 I am using your korovai recipe for the wedding of a friend’s family member who requested a traditional Ukrainian wedding bread at the celebration. I have appreciated your website and expertise so much in this journey! (I have never made korovai before, though I make other breads fairly regularly.) I am wondering – is this recipe missing some liquid ingredients? Your other korovai recipe seems to have significantly more liquid with fewer dry ingredients, and I am finding it difficult to use this recipe as-is. Let me know if you have any recommendations. I would love for you to share a picture of your Korovai. You are such a great friend to take up the task of making a Korovai for your friend. Thank you for stopping by my site…I just checked out yours, and liked several or the recipes you have posted. Very interesting. The decorations for Korovai are not really suitable for consumption…they are very hard….but Paska decorations are soft and eatable. Are you aware of any classes on making these decorated breads? I do not know what area you are from….but if you live close to NYC….the Ukrainian Museum in New York City offers classes at least once per year on various arts of Ukrainian culture, including Korovai making and decorating. Also, some places have bread decorating demonstrations organized by members of Ukrainian National Women League…you can look them up in your local area.